28-11-17 Film and Discussion Night: Sexual Violence And Masculinity: How Can Men Do Better? This post contains references and information about sexual assault which may be triggering to survivors. * Entrance fee: €2 (collected at the door). * You do not have to print your ticket, we will check your name at the door. 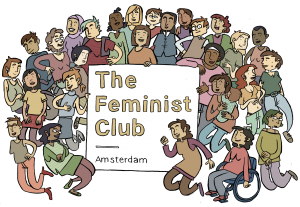 Feminist Club Amsterdam (FCA) is an online and physical community that connects self-identifying feminists in the Amsterdam area. This group was founded in August of 2015 by a small group of 15 feminists, and has since grown to an online community with almost 2000 members. We share events, personal projects, resources, tools, readings, and collaboration opportunities related to feminism in order to spark conversation and inspiration among our fellow members. FCA regularly hosts Discussion Nights, Book Club Nights and other events. To keep updated on our events and read more, visit our website. This activity is part of Emancipator’s White Ribbon Campaign. To see what other activities are being organised, visit our website.